Derive expressions for total capacitance in series and in parallel. Identify series and parallel parts in the combination of connection of capacitors. Calculate the effective capacitance in series and parallel given individual capacitances. Several capacitors may be connected together in a variety of applications. Multiple connections of capacitors act like a single equivalent capacitor. 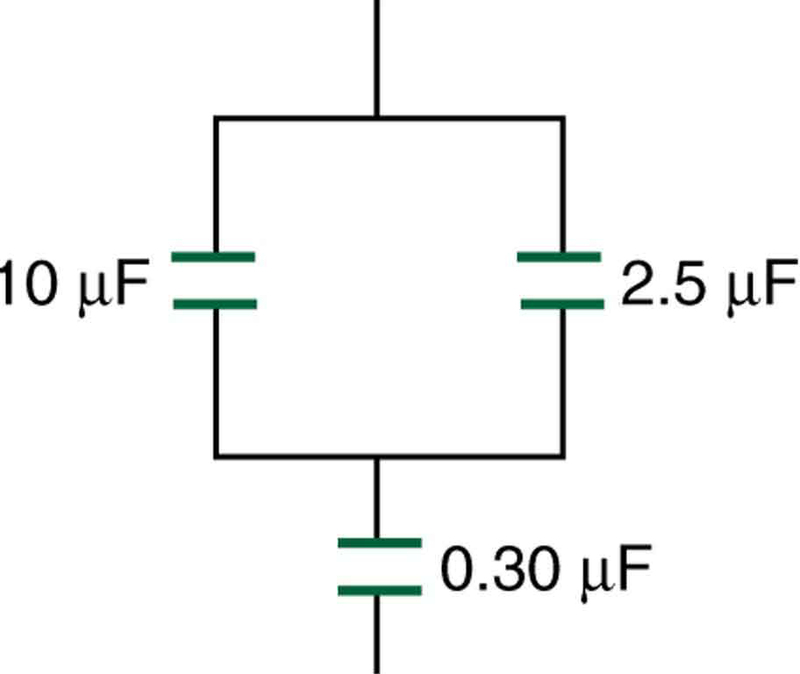 The total capacitance of this equivalent single capacitor depends both on the individual capacitors and how they are connected. There are two simple and common types of connections, called series and parallel, for which we can easily calculate the total capacitance. Certain more complicated connections can also be related to combinations of series and parallel. Figure 1(a) shows a series connection of three capacitors with a voltage applied. As for any capacitor, the capacitance of the combination is related to charge and voltage by . Note in Figure 1 that opposite charges of magnitude flow to either side of the originally uncharged combination of capacitors when the voltage is applied. 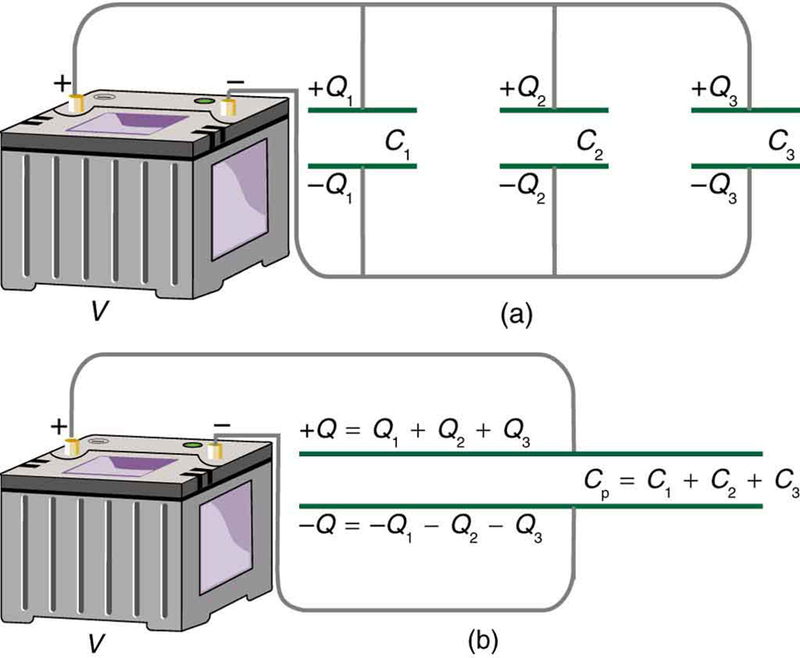 Conservation of charge requires that equal-magnitude charges be created on the plates of the individual capacitors, since charge is only being separated in these originally neutral devices. The end result is that the combination resembles a single capacitor with an effective plate separation greater than that of the individual capacitors alone. (See Figure 1(b).) Larger plate separation means smaller capacitance. It is a general feature of series connections of capacitors that the total capacitance is less than any of the individual capacitances. Figure 1. (a) Capacitors connected in series. The magnitude of the charge on each plate is Q. (b) An equivalent capacitor has a larger plate separation d. Series connections produce a total capacitance that is less than that of any of the individual capacitors. where “…” indicates that the expression is valid for any number of capacitors connected in series. An expression of this form always results in a total capacitance that is less than any of the individual capacitances , , …, as the next example illustrates. Example 1: What Is the Series Capacitance? Find the total capacitance for three capacitors connected in series, given their individual capacitances are 1.000, 5.000, and 8.000 . With the given information, the total capacitance can be found using the equation for capacitance in series. Entering the given capacitances into the expression for gives . Inverting to find yields . Figure 2. (a) Capacitors in parallel. Each is connected directly to the voltage source just as if it were all alone, and so the total capacitance in parallel is just the sum of the individual capacitances. (b) The equivalent capacitor has a larger plate area and can therefore hold more charge than the individual capacitors. The equivalent capacitor for a parallel connection has an effectively larger plate area and, thus, a larger capacitance, as illustrated in Figure 2(b). More complicated connections of capacitors can sometimes be combinations of series and parallel. (See Figure 3.) To find the total capacitance of such combinations, we identify series and parallel parts, compute their capacitances, and then find the total. Figure 3. (a) This circuit contains both series and parallel connections of capacitors. See Example 2 for the calculation of the overall capacitance of the circuit. (b) C1 and C2 are in series; their equivalent capacitance CS is less than either of them. (c) Note that CS is in parallel with C3. The total capacitance is, thus, the sum of CS and C3. Find the total capacitance of the combination of capacitors shown in Figure 3. Assume the capacitances in Figure 3 are known to three decimal places ( , , and ), and round your answer to three decimal places. To find the total capacitance, we first identify which capacitors are in series and which are in parallel. Capacitors and are in series. Their combination, labeled in the figure, is in parallel with . This technique of analyzing the combinations of capacitors piece by piece until a total is obtained can be applied to larger combinations of capacitors. 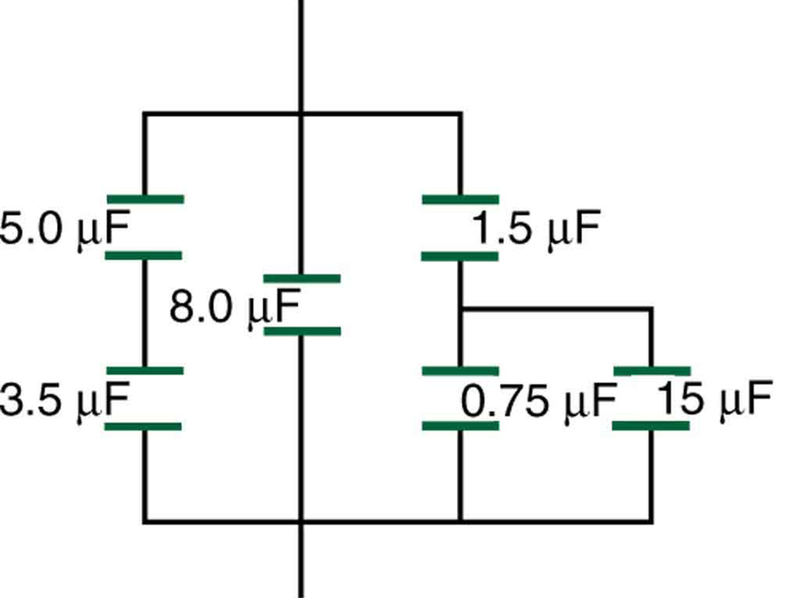 If a circuit contains a combination of capacitors in series and parallel, identify series and parallel parts, compute their capacitances, and then find the total. 1: If you wish to store a large amount of energy in a capacitor bank, would you connect capacitors in series or parallel? Explain. 1: Find the total capacitance of the combination of capacitors in Figure 4. Figure 4. A combination of series and parallel connections of capacitors. 2: Suppose you want a capacitor bank with a total capacitance of 0.750 F and you possess numerous 1.50 mF capacitors. What is the smallest number you could hook together to achieve your goal, and how would you connect them? 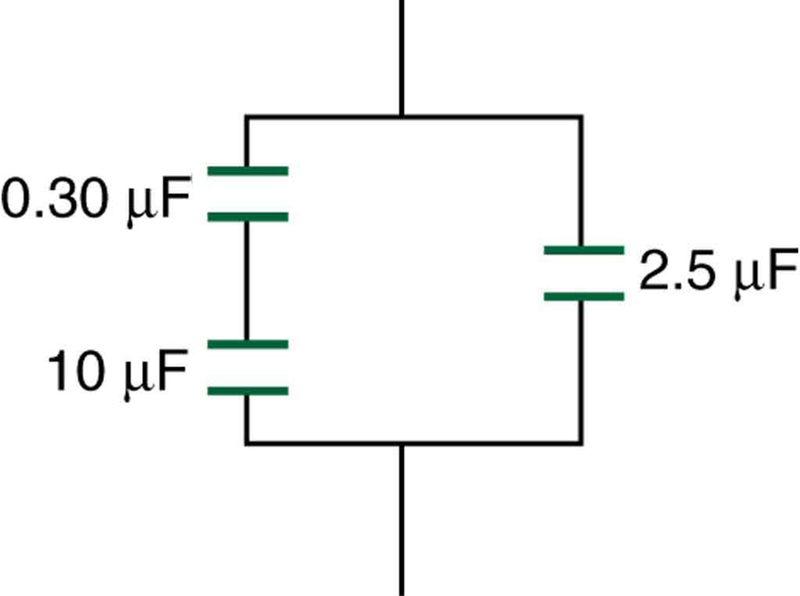 3: What total capacitances can you make by connecting a and an capacitor together? 4: Find the total capacitance of the combination of capacitors shown in Figure 5. Figure 5. A combination of series and parallel connections of capacitors. 5: Find the total capacitance of the combination of capacitors shown in Figure 6. Figure 6. A combination of series and parallel connections of capacitors. (a) An capacitor is connected in parallel to another capacitor, producing a total capacitance of . What is the capacitance of the second capacitor? (b) What is unreasonable about this result? (c) Which assumptions are unreasonable or inconsistent? (b) You cannot have a negative value of capacitance. (c) The assumption that the capacitors were hooked up in parallel, rather than in series, was incorrect. A parallel connection always produces a greater capacitance, while here a smaller capacitance was assumed. This could happen only if the capacitors are connected in series. 19.6 Capacitors in Series and Parallel by OpenStax is licensed under a Creative Commons Attribution 4.0 International License, except where otherwise noted.